Where I am reigns chaos! Today I've been at my local LUG to a joined x-mas and keysigning party. That was the most chaotic keysigning party I have ever been. Two weeks ago, when someone came up with the idea of the keysigning party, it sounded quite easy: One volunteered to do a small talk about gpg, ssl, web of trust and all that stuff. He had no time to prepare something, so he did an improvised 10 minute talk (he would have been faster, if I didn't asked questions or clarified some points he didn't knew). Other problem was, that more people than calculated came. However: The really big problem was, that somehow we tried to have three keysigning parties at once. One normal gpg/pgp party (with some people forgot to print enough fingerprints), one for Thawtes Web of Trust and one for CAcert. Beside the normal problems of lost or expired passports, the whole situation got more complicated because unexperienced users didn't knew the difference of the three (although we send previously a small HOWTO), or didn't had copies of their passports for the later two. Nice idea to do all that stuff in one go, but if we ever do such a thing again, we should really try to do it a bit less chaotic. Google has asked if they could advertise in our website. I'm still not completely sure, what I should think of this. One point is, that we already get money for placing logos, links, etc. on DVDs, flyers, posters or lanyards we give away / sell at exhibitions. We have sponsors, we take money, we earn money. IMHO placing Google ads on our website is a completely different matter, since we can't control for which we advertise. 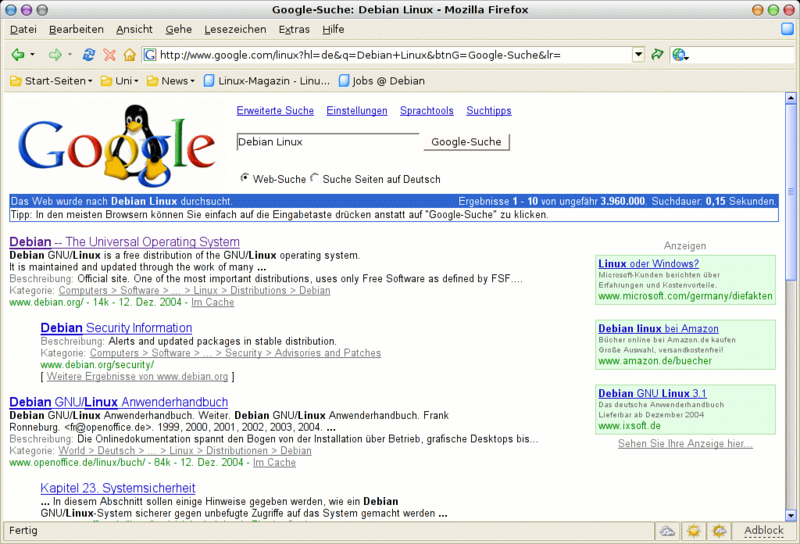 If you search in Germany on www.google.com/linux for Debian Linux the first payed Link is the Get the Facts Document from Microsoft. I took a screenshot. Joey mentioned an other point some of our unpaid sponsors, like universities, may not be allowed to host mirrors with advertisements. A couple of years bag, our university got the offer for some kind of scheduling software for lectures. It had two benefits: All of our students could search the entire universities lecture timetable online, and it was offered quite cheap. But the company wanted a hint, that we were running their software. IIRC it took about three months and a couple of letters to our ministry to clear the legal position. So I think Joey might be right with this point. I completely disagree with Martin Kraft, who stated: "more money is always good." Did you forget, that we are a free project? We should decide on technical reasons! We shouldn't sell us out, to no one. If it's a good service for our users AND it doesn't break our principles, we should do it. What I'm wondering is, why no one pointed out the political argument. I have a bad feeling about the power google gained in the last years. For many people a document not listed at google does not exist. Many people don't know any other search engine at all. You might have heard stories about google removing pages in different countries. I have a really bad feeling about google and their business. If you ask me, our browsers should not have google as their default search engines for political reasons. But since the Google offers currently the technical most advanced solution, I don't think many people will understand my fears. You think, I won't have time for my blog? Ha! Look! Here is a second one! Somewhere out there are my fans, getting crazy, when reading this, knowing, that they'll hear my wisdom more often.